The new College for Architecture and Planning (CAP) in Denver, Colorado plugs into what could be a smarter grid by phasing out traditional centralized coal power with a sustainable local (and more competitive) power network. By applying new and innovative technologies coupled with strategic passive design, the new CAP building in Denver provides a new learning center that does more than just facilitate the education of the next generation of designers and planners. 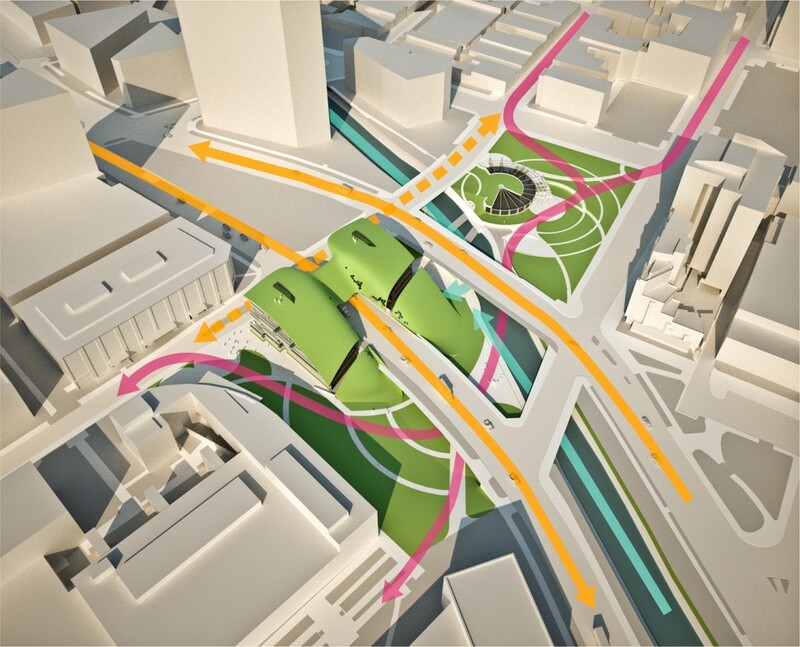 The project creates a new gateway between the city and the campus, reaches out to involve and educate the public, and will literally green the entire campus with its sustainable power and agriculture. Every aspect of the new College of Architecture and Planning is geared toward reducing the strain on resources. The toilets are connected to a compost system that also utilizes all of the organic material from the cafe. 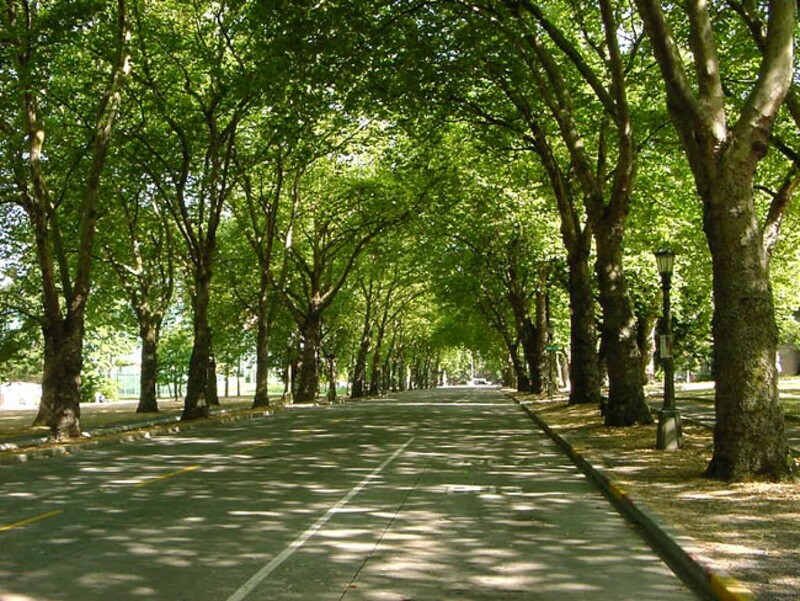 Landscaping clippings are added as an important carbon rich material. Bio-filters and the stack ventilation of the solar tower ensure there is no unpleasant smell. This valuable compost material is rich in nutrients and will even help plants defend against diseases when used across the entire campus. Utilizing building waste to create a beneficial pleasant smelling material called humus is currently in practice today by the Denver Metro Waste Water District. This plant fuel is sold and used around Colorado. One major difference at the CAP is that the rich organic material is used to make the compost prior to entering the sewer system and mixing with thousands of various pollutants. Another reason the compost is created on-site is so that it has the ability to heat the building. Thermophilic activity in the compost destroy disease pathogens and increase the temperatures. The compost can operate between 131 degrees Fahrenheit to an incredible 221 degrees Fahrenheit (above the boiling point of water). Spontaneous fires have started at two American composting plants — Schenectady and Cape May — but this was due to an excessively dry and large compost mass. The concrete construction of the building is a thermal mass for the radiant heating system. The loops extend into concrete vaults that the compost is stored in. 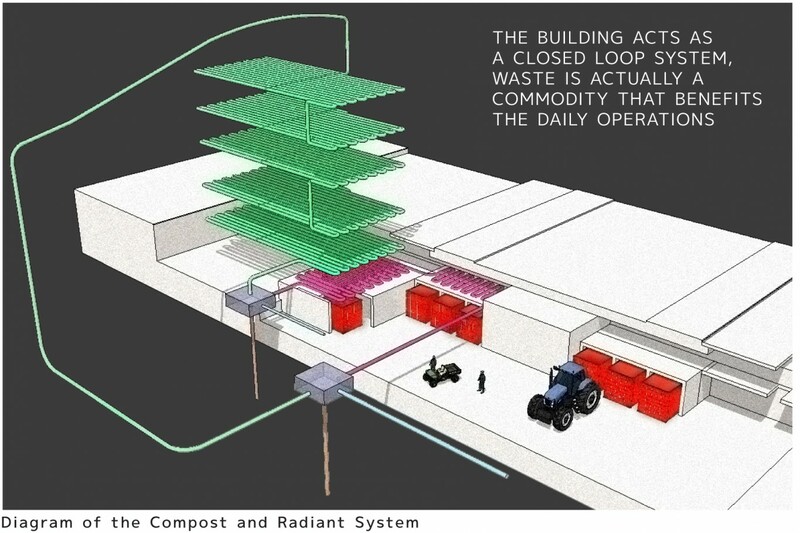 They draw the heat from the rotating compost containers and heat the building. The pipes are exposed on the roof in a solar collector that will heat the fluid and create a negative pressure at the highest point. This direct gain solar collector is also connected to a solar chimney that will ventilate the building and the composting toilets. An architectural expression is created in the south facade with passive and active strategies. Printed photovoltaic spandrel panels add a colorful pattern to the glass. A combination of sunshades and cantilevered portions of the building shade the interior from summer sun. Light shelves allow indirect light to enter the clerestory for ambient lighting conditions that penetrate deep into the narrow building footprint. 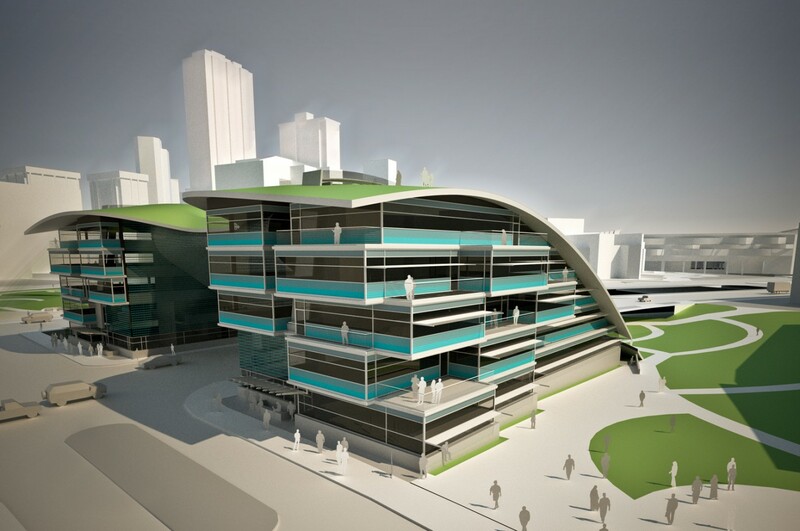 The sky bridge connects the two buildings, but also creates a surface for the application of piezoelectric wind panels (which are still being researched in the United States). These lightweight Teflon coated panels can operate at very low wind speeds (portfolio, fig 1). This allows them to be located at lower elevations and in new places that current wind power technologies do not practically operate at. The wind current is assisted by the southeast vehicular traffic on the road underneath and the prevailing southeast winds. 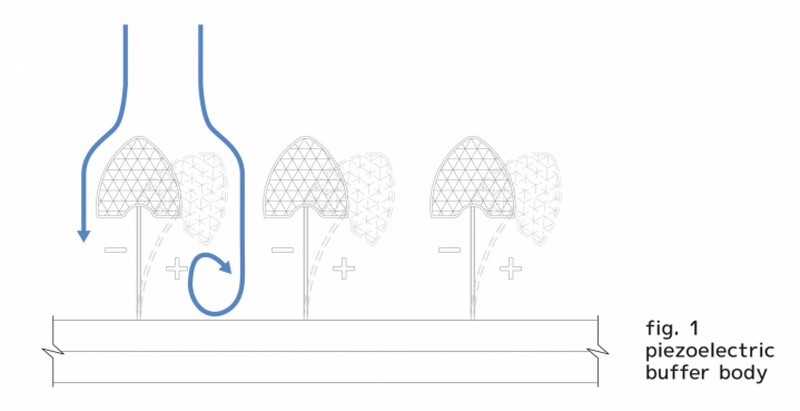 The panels not only generate power but act as a wind sculpture as well (image of tree leaves).